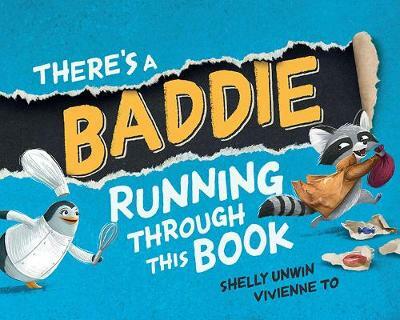 There's a baddie running through this book, Turn the pages; have a look. There he goes, did you see? Sound your siren, chase with me. Kids, watch out! A baddie is on the loose and only you can catch him. But this baddie is very sneaky. He's going to have you looking for him every... read full description below. There's a baddie running through this book, Turn the pages; have a look. There he goes, did you see? Sound your siren, chase with me. Kids, watch out! A baddie is on the loose and only you can catch him. But this baddie is very sneaky. He's going to have you looking for him everywhere...up and down, and around and around...until the very last page! Shelly Unwin grew up in a tiny English village where she was surrounded by animals, the occasional pixie fairy, and her best friend Cracker, a feisty palomino pony. She is the author of the You're... series, illustrated by Katherine Battersby, and Blast Off!, illustrated by Ben Wood. Shelly lives in Canberra with her husband and two children. Vivienne To grew up in Sydney and has always loved drawing interesting characters, creatures and imaginary worlds. She has created designs for several animated feature films, and is the illustrator of The Sloth Who Came To Stay, written by Margaret Wild. Vivienne lives in Wellington, New Zealand.